OMAHA — Nebraska Medicine, the largest health care facility in Nebraska, has just completed a major upgrade to its flagship outpatient pharmacy. According to Vince Jorn, director of community based pharmacy services, the newly expanded pharmacy tripled in size from 2500 to 7500 square feet. RxSafe automated storage and retrieval system. “The big news is not just that that we have expanded our footprint but that the expansion allowed us to invest in new technology to better support the kind of services we provide,” says Jorn. With more space and new technology, the pharmacy has the tools it needs to better manage our system wide meds-to-bed program, specialty and retail pharmacy offering. Nebraska Health has three outpatient pharmacies, which combined last year filled more than 300,000 prescriptions. To help fill prescriptions faster and more accurately the three-million-dollar expansion of the main out-patient pharmacy included three new pieces of technology. According to PerceptiMed, Nebraska Medicine is the first pharmacy in the state to deploy the scripClip, pick-to-light, will-call bin system. Introduced in 2016, the system features clear plastic hanging bags with LED lights imbedded in each bag’s handle. The secret to the success of the new system is PerceptiMed’s proprietary software that interfaces with the pharmacy’s dispensing system to know which bag holds each patient’s prescriptions. Then, via radio waves it activates the LED light on the correct bag for each patient causing the bag handle to light-up so the cashier can see and retrieve the bag quickly. Barcode scanning at the cash register insures the right bag is given to the right patient, every time. Jorn says the flashing lights and well-organized will-call bin are the source of a number of positive comments from impressed patients picking up their medicine. And, because the new will-call bin looks so impressive the pharmacy chose to use the will-call bin rack and hanging bags to separate the dispensing area from the patient pick-up area. This eliminates the need for pharmacy personnel to hand transfer filled prescriptions from behind a solid shelving area to the patient pick-up area, saving a few seconds on every transaction. 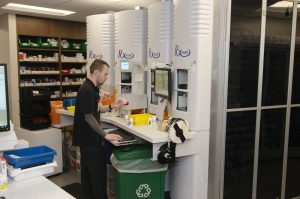 The pharmacy also installed a four-tower RxSafe automated storage and retrieval system. The RxSafe stocks thousands of medications, in manufacturer’s stock bottles, in secure cabinets. Facilitated by scanning a barcode the system delivers the bottle to the technicians’ work area. The technician counts out the proper amount of medicine, puts it in a prescription vial, affixes the prescription label and prepares it for the pharmacist final check, at a rate of over 100 scripts per hour. One of the unit’s most important time saving aspects is that it eliminates the need for the technician to walk the pharmacy’s shelves, pull the bottle from the shelf, return to their work station, fill the prescription and then retrace their steps to return the bottle. And, the company says all medications are securely stored in the RxSafe cabinet, thus reducing the chances of theft or misplacing a product that has been improperly returned to stock. The RxSafe system is the only accurate, real-time, perpetual inventory management system on the market, designed to store 100% of a pharmacy’s inventory, including remote stock items. 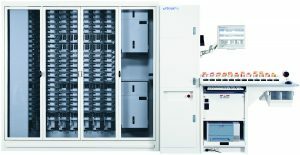 The ScriptPro SP 200 Prescription Dispensing System. Rounding out the trio of technology improvement the pharmacy replaced its 19-year-old ScriptPro robot with a new ScriptPro SP 200 Prescription Dispensing System with a 12-slot Collating Control Center and with an electronic door and cell locking system. The 12-slot Collating Control Center sorts filled prescriptions by patient name and then, via an LED display screen, informs the pharmacy technician if the patient has multiple prescriptions so they can all be retrieved at the same time. The electronic locking systems provides increased security as it allows access only to authorized personnel. “Nebraska Medicine has long been on the forefront of adopting advanced technologies. They were one of the early users of the Robotic Prescription Dispensing System pioneered by ScriptPro in the late 1990’s to ensure safety and efficiency in pharmacies. We are very pleased that they will be using our latest robot model in this state-of-the-art pharmacy,” said Mike Coughlin, chief executive officer at ScriptPro. The new robot is able to fill six prescriptions at the same time allowing it to fill 150 prescriptions per hour. Each prescription is counted, put into the appropriate size prescription vial, labeled and then put on a conveyor belt where pharmacy personnel can pick them up, do the final pharmacists check and put them in the scripClip bag for delivery to the patient. The pharmacy reports that 40% of the prescriptions they fill are now handled by the robot. Nebraska Pharmacy personnel were so pleased with the service they got from ScriptPro on their original robot that it was easy for them to recommend to management they stay with ScriptPro when the time had come to upgrade. To showcase the physical improvements and the upgraded technology the pharmacy hosted an Open House on Jan. 16, for hospital staff, physicians and the general public.